From the world of Stella Montgomery whom many may have met in Withering-by-the-Sea, comes A Garden of Lilies, the book that Stella’s aunts gave her to read in Wormwood Mire. It is not part of the Intrigue series but a stand-alone book on etiquette, manners and decorum; imperative learning material for children of the Victorian era. Its handbook style covers virtues and vices, moral behaviour, and misbehaviours and their consequences. The lessons are disguised as stories reinforced with a dramatic, abrupt and unbelievable ending. Using extraordinary examples of bad outcomes due to disobedience and lack of good manners was in fact the way children were taught in the 1800s. I loved the names of the characters and the language used, and found myself easily visualizing those times, habits and customs due to the excellent prose. 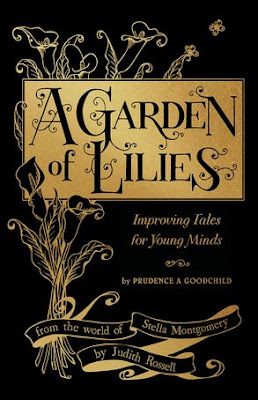 In A Garden of Lilies, to ‘enliven dull conversations’ children are encouraged to memorize particular facts to impress, or use when boredom sets in. The knowledge of table manners and the correct use of cutlery (accompanied by an illustrated and numbered list of each item and its correct use) is an essential part of good breeding. Housekeeping hints for baking economically to avoid waste, and darning, which is shown in detailed illustrations, encourage thrift. Learning how to create a compass with a stick and being familiar with a code of signals is a must. Imperative is the knowledge of parlour games played in ‘respectable homes’. The language of flowers, and how to write a letter to a person of distinction using the correct form of address (all listed), is highly recommended. (I didn’t know any of this!) There is also a correct way to brush hair! Bound in black cloth, and adorned with decorative lilies and lettering in gold, this is a stunning gift book full of knowledge. Readers of all ages will be astonished by how much social history Rossell has managed to fit into this little book. Gorgeous black and white illustrations in the company of a few full colour images, show the dress code, Victorian way of life, and project the strict habits adhered to by ‘well bred’ people. How will Stella react to the contents? We’re sure to find out in Wakestone Hall: Book 3, of the Stella Montgomery Intrigues, out soon.